Craig Taborn played six nights at the Stone this past week in a highly anticipated residency. 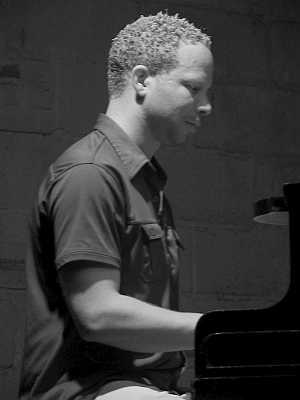 Taborn, who is widely regarded as one of the most talented and innovative piano players since he emerged in the mid-1990s, put on a broad range of fascinating performances. Each night featured different bands and he drew from his long-standing associations with many of the premier players on the New York scene as well as a few newly established or one-time formations. The week was a resounding success, showcasing an array of musical ideas. This review focuses upon two of the sets included in the week. Wednesday night’s late set featured Taborn and drummer Ches Smith–the two having played together a great deal in Smith’s trio–along with Danish alto saxophonist Mette Rasmussen. The three musicians presented four pieces of fierce energy music, each of which took different forms. One would have thought the unit had played together extensively before, because from the first notes they connected immediately, especially on an aesthetic level. Taborn is well-known for his fearless playing at lightning speed; Smith is a versatile poly-rhythmic drummer whose intensity matches his imaginative improvisations; and Rasmussen is a bold, confident, and searing saxophonist who matched the others step-for-step and often led the surge forward. The first piece opened with a no-holds-barred statement about what the band was capable of and concluded with a short solo from Taborn. The second piece took a more accented turn, though at times with vast openness that allowed the flashes of color from each player to contrast so starkly against the dark backdrop. The third piece opened with a long, contemplative duet between Rasmussen and Smith, but once joined by Taborn the piece jolted forward, grew tight together, and crescendoed towards a long climax. After reaching its first peak, the players shifted towards a more autonomous interlude before building again. When the push came, it reached an ecstatic level of energy rarely matched in free jazz or improvised music circles today and only after moving to the brink and holding it there did the three eventually allow it to melt into a more fluid and soulful sonic alchemy. The emergence of Smith’s methodical rhythms then worked to structure the brief mellowing of the piece before it concluded with a saxophone and piano duet. Taborn, Rasmussen, and Smith then concluded the evening with their most sophisticated improvisation of the night. The piece featured each player making decisive statements within a shared aesthetic palette, built upon structured energy that propelled the group towards the peaks once again. Throughout the set, the band connected and responded to one another with a rare familiarity and without hesitation in an emotionally evocative way that allowed the three to reach their full potential as interactive improvisers. Confidence, determination, and the desire to embrace the audience with externally-derived energy made this one of the most exhilarating nights of music that I have seen in some time. From the first notes, Taborn, Rasmussen, and Smith connected deeply and never looked back. On Friday night, Farmers by Nature–Taborn with bassist William Parker and drummer Gerald Cleaver–played two sets of music that strongly contrasted the music of the Wednesday night late set. Farmers by Nature has been active for nearly a decade, though given the busy schedules of the three members of the collective, live concerts are a rarity. But, when the three do manage to convene, it is a true delight because of how comfortable each is with the others, as exhibited through the tight connections present in their playing and the support each offers to the others as they interact. The music also benefits from the amazing level of respect the three musicians show each other by not only providing space for ideas to emerge and evolve, but also to contribute to bringing a shared musical vision to fruition. For the first set, the band played one long improvised piece. Throughout the set, the music possessed a sort of collaborative sentience–each player contributed to its evolution, while bringing their own truth to the collective. Within moments, the three felt fully calibrated–having reintroduced themselves, the three masterful players settled down for a deep and intense musical conversation. Taborn, Parker, and Cleaver each took turns in leading that interaction in the kind of tight association that is built on trust and intimacy in sound. The music had a strong and robust center–even as it shifted as each transformed it, the piece itself felt very grounded, whether by the presence of constant propulsion, or by the patient evolution. Some of Taborn’s most exciting playing came as he led the group towards the peaks of the piece. Cleaver’s direct, yet unobtrusive style provided constant forward-motion outlined in flashes of light. Parker exhibited some very inventive playing–even taking a solo played with two bows, one on each side of the bridge that seemed to illustrate the dual-nature of the music. Together the music they produced hung in the air like shimmering curtains of sound that form the threshold between the reality that we can touch, hear, and see, and that which lies beyond. In sonic gestures of profound and honest beauty, they moved along that precipice, drawing the audience along for the journey, allowing all who witnessed it a chance to glimpse through the veil.